In 1979 Conservative leader Margaret Thatcher was elected as the new British Prime Minister. One of her first roles in office, was to review of the UK's current and ageing Civil Defence Plans for Nuclear War. Since the "Spies for Peace" scandal of 1963 and the locations of the RSG's revealed to the world, it was obvious that a new network of Nuclear Bunkers were needed to run the country from, if Nuclear War occured. The old RSG's were to be replaced by 22 purpose built Nuclear Bunkers called: Regional Government Headquarters (R.G.H.Q.). The 22 new bunkers were to be scattered across the UK, 15 in England, 2 in Wales, 4 in Scotland (Reduced to 2 in 1983) and 1 in Northern Ireland. The old Defence Regions were also reviewed and changed, during the RSG era, Scotland and Ireland were not included in the Defence Regions. In 1980 this changed and Scotland became Region 1 and Northern Ireland Region 11. Alongside the new allocation of the Defence Regions, each Region was then sub-divided into two sectors, controlled by a RGHQ and a secondary subordinate RGHQ. What wasn't taken into account at the time, was the huge costs involved in this new network of RGHQ's. The rapid advancements in Nuclear Weapons during the late 1960's and 1970's meant that, the level of protection now needed for a Nuclear Bunker to survive a direct or even near miss had quadroupled, and so had the cost. The Government quickly realised that 22 brand new Nuclear Bunkers were never going to be approved by Parliment, this left only one option left, refurbish exhisting facilities owned by the Government and Ministry of Defence. The idea was accepted, and work began on choosing the locations for the new RGHQ's. The old RSG's were out of the question but oddly enough, R.S.G. 9 - Drakelow and R.S.G. 7 - Hope Cove ROTOR Bunker were chosen. The rest off the locations comprised of a mix of WWII Cold Stores, Royal Observer Corp Group Headquarters and RAF ROTOR Bunkers from the 1960's. The locations were far from indestructable but were cheap and afforded a certain degree of protection. Only 4 purpose built RGHQ's were ever built: R.G.H.Q. 6.1 - Crowborough 1984-1986, R.G.H.Q.7.1 - Chilmark 1985, R.G.H.Q. 11 - Ballymena Northern Ireland 1989 and R.G.H.Q. 1.1 Cultybraggen Scotland 1990. 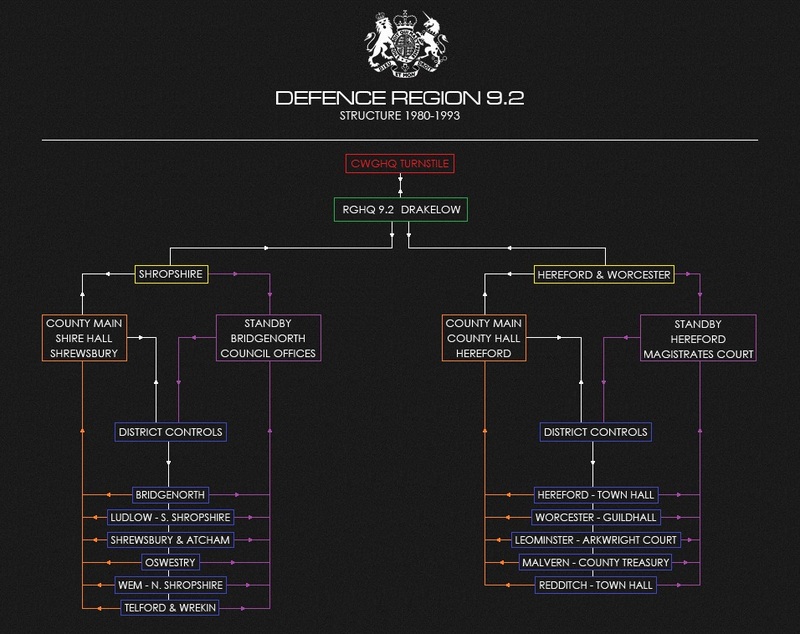 Defence Region 9 remained the same as it did during the RSG era, but was now divided into Region 9.1 and 9.2. Region 9.1 covered Staffordshire, West Midlands and Warwickshire and was controlled by R.G.H.Q. 9.1 - Swynnerton. Region 9.2 was controlled by R.G.H.Q.9.2 - Drakelow and covered Shropshire, Hereford and Worcester. The RGHQ at Swynnerton, was located in the old WWII Royal Ordnance Factory which closed in 1957 and was re-activated in 1962 as a Sub Regional Headquarters. The bunker was actually two converted semi-sunken explosive magazines, connected by a concrete tunnel a few feet under the earth. The RGHQ at Drakelow was to be the lead HQ for Defence Region 9, the task of upgrading Drakelow to RGHQ standards was relativley simple but would be costly. The task of where to locate the RGHQ was quite simple, it was to be placed within the old RSG itself, albeit some what reduced in size to less than 50% of the original RSG. The staff needed to operate it was also reduced to from the 350 for an RSG to 140 for an RGHQ. The conversion started in 1980 and was expected to be complete within the year, in reality this upgrade went on until 1986 and in the end cost over £2 million. 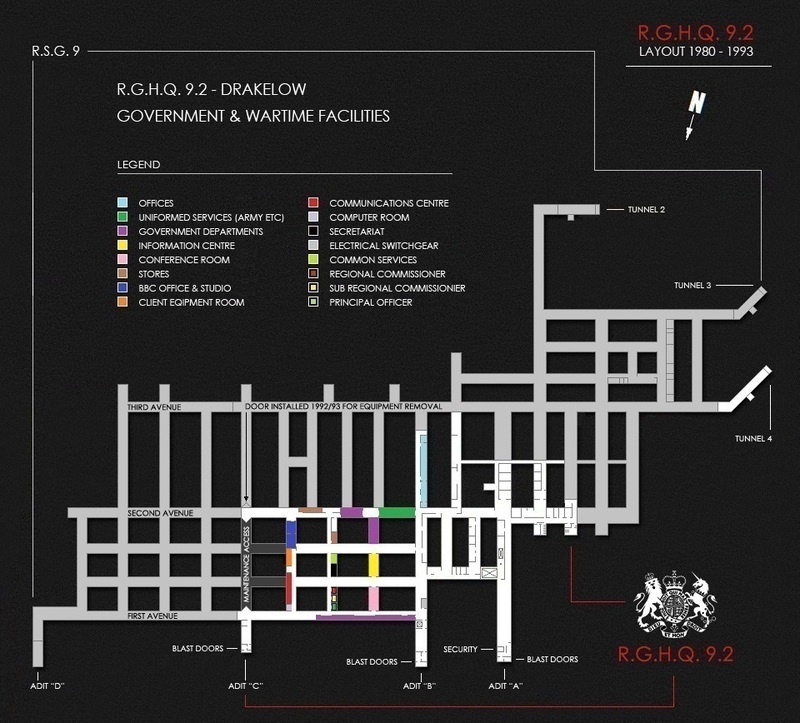 The upgrades needed to bring Drakelow upto RGHQ standards were done in stages, first was defining its actual area and seperating it from the old RSG, this was done as it was when the RSG was sealed off from the Rover Shadow Factory back in 1961, a series of purpose built brick walls seperating it. Securing and strengthening the entrances was some what of a strange combination, the Adits were all equipped with triple 2 inch blast doors but the original entrance tunnels including Tunnel 4 which was to be used for deliveries and equipment installation was not changed, the original WWII wooden doors were left in place. This meant the front of Drakelow was secure from a Nulcear blast, but the tunnels were not, the only thing seperating this side of the complex from fall-out or a Nuclear blast was two sets of 40 year old wooden doors and a few brick walls. The doors to Tunnel 4 were finally removed in 1992 and replaced by steel Blast Doors. As part of the upgrade the main power supply was updated, a new ventilation system with high grade filters and a dedicated dehumidification plant were installed. The dehumidification plant also served as a stand alone heating system providing a constant temperature of 18°C / 64°F. The air conditioning was also upgraded and two brand new water tanks installed. The water tanks comprised of a central tank which was fed directly from the main line owned by Severn Trent Water, in the event of Nuclear War this tank would of been shut off. The second tank was fed from a purpose built 70ft borehole, this would of supplied the toilets and ammenities as well as the fire hoses. The borehole tank could also be used to supply drinking water if needed in times of crisis. Both tanks had a combined capacity of holding 90,000 litres of water. Two 147KW diesel genrators were also installed in case mains electricity was severed. The generators were set up in a two phased circuit, the first would automatically kick in once the mains had gone, this would continue to supply power to the communications, air conditioning, security measures, sections of the canteen and lighting. The second generator acted as a back up or could be used to supply power to less non essential services within the rest of the RGHQ. The diesel supplying both generators was supplied from a fuel tank adjacent to the generators, the diesel supply was enough to serve the entire RGHQ for a period of 4-6 weeks. To ensure the generators did not fail or flood the tunnels with carbon monoxide, a purpose built blastproof room was added onto the front of the Generator Hall, this extracted the exhaust fumes and discharged them through two ventialtion pipes outside of Adit "D". This room also housed the radiators for both generators and fed fresh air in through the Generator Halls own independent ventialtion system. A purpose built canteen was installed in 1986, as the old one from the RSG era which had been left, was located outside of the RGHQ. Adjacent to the kitchen was the old Games Room used by Rover in WWII, this was converted into a 50 seat canteen. The equipment was state of the art at the time, and included a sandwich maker and "Still" coffee / tea machine. The storage of food for the kitchen remained as it did in the old RSG era, no food was to be stored on site. In the run upto War, the Home Office would approve the delivery of ration packs or rat-packs as they were more commonly referred to. 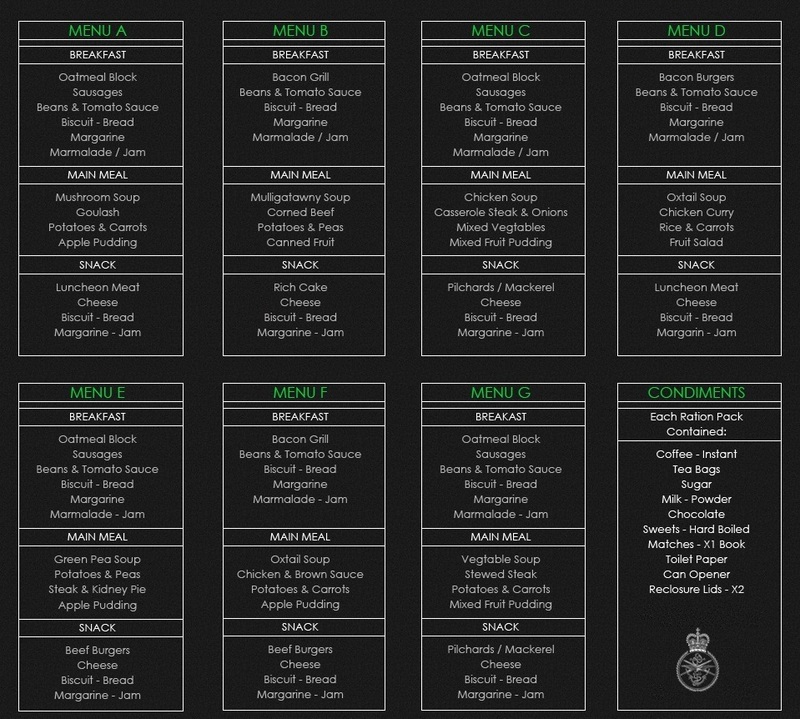 The rat-packs were emergency rations issued to all UK Armed Forces and consisted of a mix of dried and tinned food, they came in 6 varieties and had a shelf life of three years. In the mid 1980's the Ministry of Defence took over the distribution of all rat-packs to the RGHQ's. Each delivery could sustain the staff of and RGHQ for a 30 day period with an additional 14 day reserve stockpile. The rat-packs would of fed the: Regional Commissioner, Deputy Regional Commissioner, Principal Officer, Secretariat, x4 Scientists, x4 Communications Officers, x8 Typists, x3 BBC Staff, x44 Government Officials, x6 Kitchen Staff, x2 Maintenace Staff and x25 Uniformed Services Officers as well as additional Military Liason Officers from the Army, Navy and the RAF. In 1986 the old communications equipment at Drakelow was removed and replaced by the Message Switching Exchange (M.S.X.). The M.S.X. System was completely automated and more efficient than the old Teleprinter network that had been the backbone of the Governments Emergency Communications Network (E.C.N.) for the past two decades. The old Creed Type 7B Teleprinters and perforating machines made sending messages a time consuming affair, in order to send a message, first it would have to be encrypted then routed, if the destination address was busy or out of action, a human operator would then have to physically re-route the message to another destination, meaning any immediate action required would be seriously delayed or compramised. The M.S.X. system removed the need for a human operator completely, when a message was sent the M.S.X. routed the message to its destination and County Switching Exchange (C.S.X. ), simultaneously. If for any reason these routes were out of action the M.S.X. would then route the message to alternate destinations, including other M.S.X. 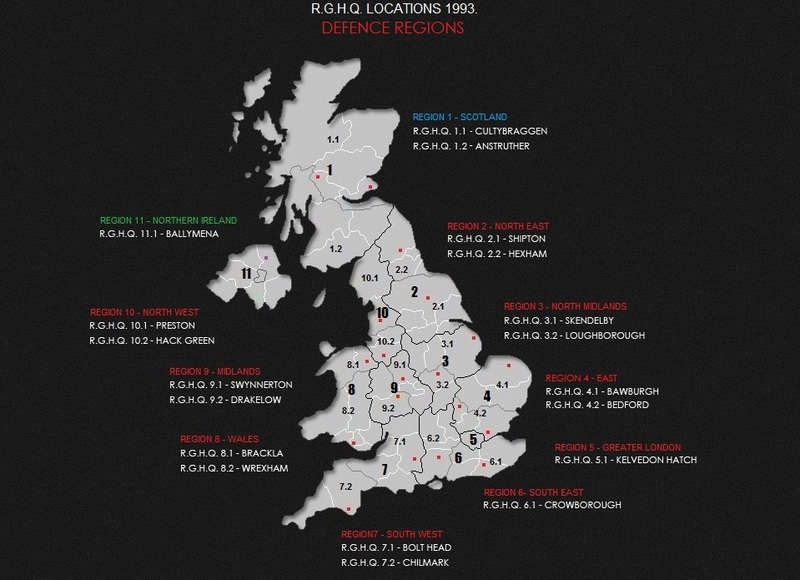 units in the RGHQ's throughout the UK. It could also save messages that had been undelivered and re-send them when the original destination became active again. In addition to the M.S.X. Drakelow was also equipped with 200 hard lines, which included a dedicated line to the Central Government War Headquarters in Wiltshire (Known as CGWHQ Subterfuge in the RSG era, this was later changed to: CGWHQ Chanticleer 1970-1987, CGWHQ Peripheral 1987-1992 and CGWHQ Eyeglass 1992- 2004). A dedicated line to the Home Office Emergency Manual Switch (E.M.S.) was also installed, as well as 15 lines to the Public Switched Telephone Network (P.T.S.N.). Radio communications were also installed, known as "Hill Top" , these served as a back up if the M.S.X. and hard lines failed, they also enabled direct communication with the Military. Radio communications were only installed in the RGHQ's in the run up to Nuclear War, and were installed by the Territorial Army's No. 2 Signal Group (National Communications). For Defence Region 9, the Territorial Army's No. 872 Signal Troop would of installed radio equipment at both R.G.H.Q. 9.1 - Swynnerton and R.G.H.Q. 9.2 - Drakelow. 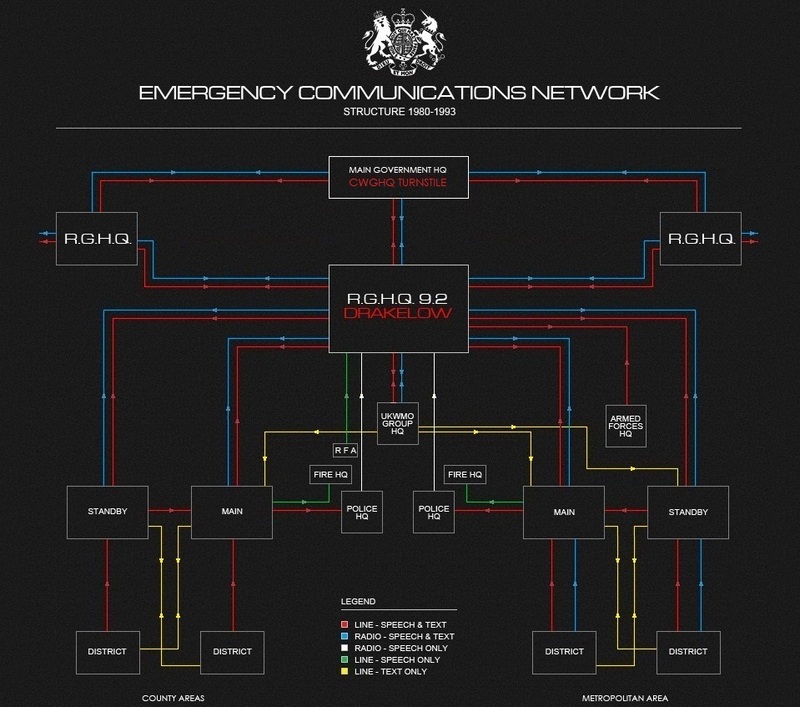 The radio communications where installed in two phases, the first phase would allow communications between Regional Military Units and Emergency Services, the second phase was a dedicated encrypted system known as Control by Radio (CONRAD). CONRAD was a secure Single Channel HF Radio Telelprinter System, which enabled the Military and Government to communicate with each other. After a Nuclear Strike it was thought most of the static communications systems ie. telephone exchanges and hard lines, would of been knocked out. CONRAD on the other hand was a mobile system, comprised of: 66 mobile radio stations which worked through 3 Gateways (3 Mobile Radio Trucks), CONRAD would of been operated by the Royal Corp of Signals and only have been used after a Nuclear Strike. The communications mast from the RSG era was also upgraded to aid reception for radio communications, and the BBC Wartime Broadcasting Service (W.T.B.S.). BBC WARTIME BROADCASTING SERVICE - W.T.B.S. Once Nuclear War had been declared, the BBC would of broadcast a series of pre-recorded messages which would be transmitted all across the British Isles. Once NATO had confirmed an Attack, the Government would of given the BBC the Codeword: MACMORRIS, this instructed the BBC to activate 24-hour operations, a second Codeword: FLUELLAN was then issued, this was the prompt to activate the WTBS precautionary announcments. If the situation worsened, Codename: SHADWELL would be issued to the BBC, this would initiate the second phase of the precautionary pre-recorded announcments, which adivsed the public on re-tuning their radios and when to listen for the next broadcast. At this stage it was only a matter of time until the UK would of been hit by Nuclear Weapons. 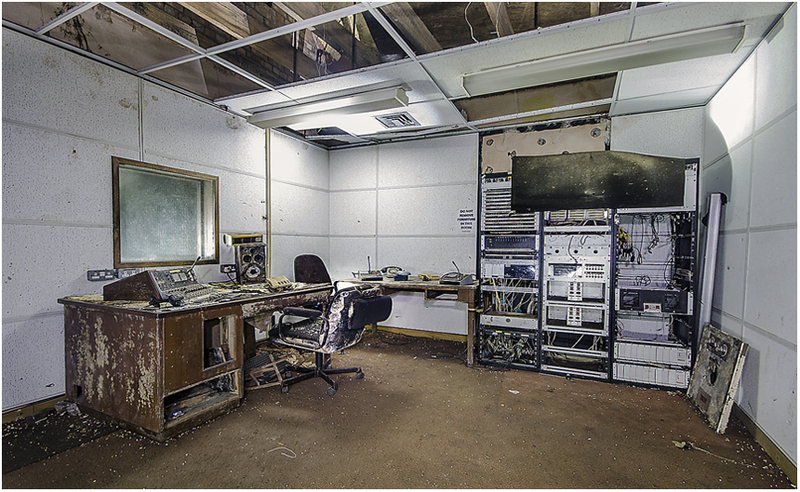 BBC Studio - The fate of 5.6 million people from the Midlands would have been broadcast from this room, if Nuclear Weapons were dropped in Defence Region 9.2. This is the Wartime Broadcasting Service. This country has been attacked with nuclear weapons. Communications have been severely disrupted, and the number of casualties and the extent of the damage are not yet known. We shall bring you further information as soon as communications have been restored. Meanwhile, stay tuned to this wavelength, stay calm and stay in your own home. 2. Remember there is nothing to be gained by trying to get away. By leaving your homes you could be exposing yourselves to greater danger. If you leave, you may find yourself without food, without water, without accommodation and without protection. Radioactive fallout, which follows a nuclear explosion, is many times more dangerous if you are exposed to it in the open. Roofs and walls offer substantial protection. The safest place is indoors. 3. Make sure the gas and other fuel supplies are turned off and that all fires are extinguished. If mains water is available, this can be used for fire-fighting. You should also refill all your containers for drinking water after the fires have been put out, because the mains water supply may not be available for very long. Water must not be used for flushing lavatories: until you are told that lavatories may be used again, other toilet arrangements must be made. Use your water only for essential drinking and cooking purposes. Water means life: dont waste it. 4. Make your foods stocks last: ration your supply, because it may have to last for 14 days or more. If you have fresh food in the house, use this first to avoid wasting it: food in tins will keep. 5. If you live in an area where a fall-out warning has been given, stay in your fall-out room until you are told it is safe to come out. When the immediate danger has passed the sirens will sound a steady note. The all clear message will also be given on this wavelength. If you leave the fall-out room to go to the lavatory or to replenish food or water supplies, do not remain outside the room for a moment longer than is necessary. Do not, in any circumstances, go outside the house. Radioactive fall-out can kill. You cannot see it or feel it, but it is there. If you go outside, you will bring danger to your family and you may die. Stay in your fall-out room until you are told it is safe to come out or you hear the all clear on the sirens. Water must be rationed, and only used for essential drinking and cooking purposes. It must not be used for flushing lavatories. 7. We shall repeat this broadcast in 2 hours time. Stay tuned to this wavelength, but switch off your radios now to save your batteries until we come on the air again. This is the end of this broadcast. 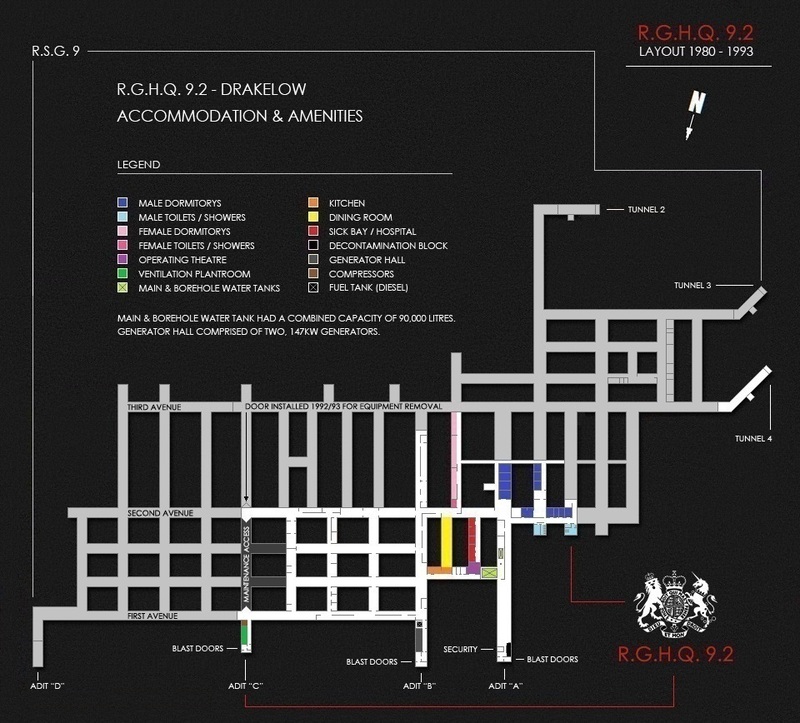 By 1990 new plans were being drawn up for RGHQ 9.2 - Drakelow, the PSA Directorate of Civil Projects suggested that the area occuppied by the RGHQ at Drakelow should be reduced, as should the accomodation and facilities in order to bring it up to the latest standards. A further suggestion was also put forward to build a new purpose built blast proof bunker on the surface, this would of meant the Tunnels would of been completley abandoned. The PSA's suggestion were debated but never implemented and RGHQ 9.2 remained within Drakelow. In 1992 the former Royal Observer Corp Group HQ at Lawford Heath was stood down by the Ministry of Defence. The MoD suggested that the costs of upgrading Drakelow again would be astronomical, and proposed the the RGHQ should be moved into the ROC Bunker at Lawford Heath. Whilst the move the Ministry of Defence had suggested made sense, it would of put RGHQ 9.2 outside of its Regional Control Area (Defence Region 9.2), as Lawford Heath was located within Region 9.1. A similar relocation scheme for three other RGHQ's was also suggested. RGHQ 9.2 Surface Buildings - Blakeshall Common School (Left), Boiler House (Center), Goods / Despatch Building (Right). Demoilshed 1984 - 1995. 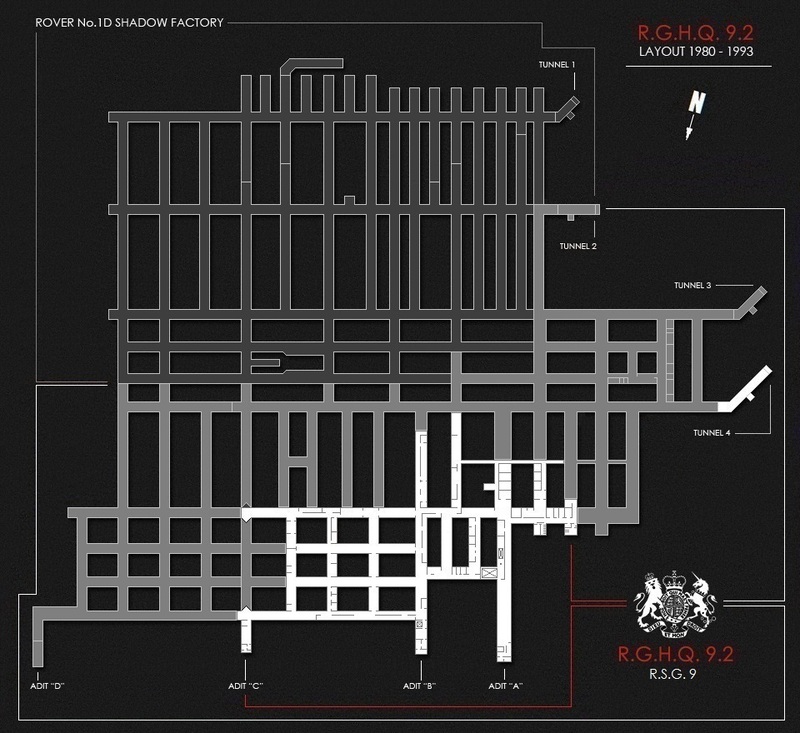 With the end of the Cold War in sight, the UK Government abandoned the CWGHQ at Wiltshire and the RGHQ Network in favor of a new system, a Â£126 million purpose built bunker underneath the Ministry of Defence HQ at Whitehall was constructed, Codenamed: PINDAR, along with the Join Operations Centre at Northwood, all future national crisis would be handled by these two new HQ's. In 1993 the Ministry of Defence decommissioned RGHQ 9.2 - Drakelow, once all the equipment was removed, the MoD handed the entire complex over to W.S. Atkins Property Services for disposal. Squirrel Storage of Leeds initially showed an interest in the site, as a secure storage facility for documents, the sale however fell hrough. Drakelow remained on the market until 1994 when it was purchased by its current owners. 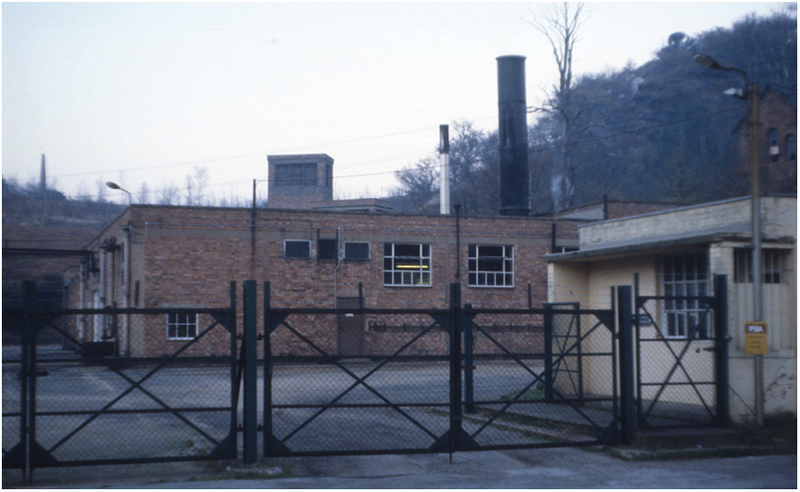 RGHQ 9.2 Gate House to Tunnels 1 & 2 & Boiler House (Demolished 1990). - Photo courtesy of Subterranea Britannica - Taken 1979 / 1980. 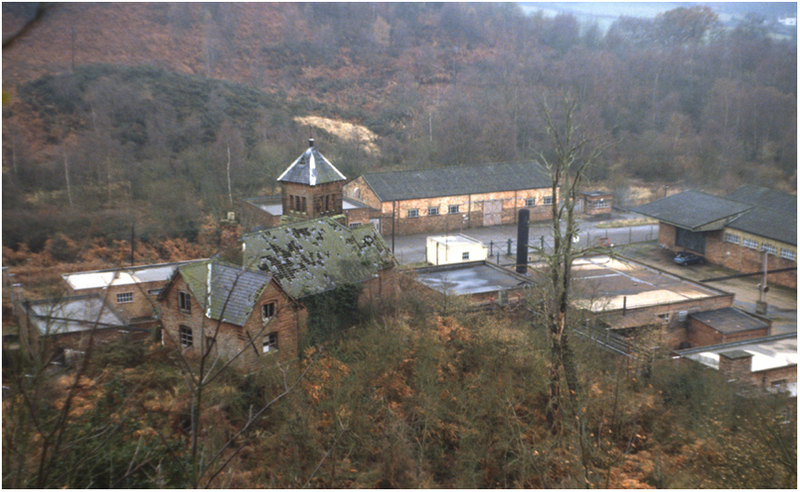 In March 1992 a British Telecom engineer shot a small home video of Drakelow Tunnels, at this time the facility was still owned by the Ministry of Defence. Shortly after this video was made, all of the BT equipment was removed from the complex. To date, this is the only known video that exist's of RGHQ 9.2 Drakelow! The history on RGHQ 9.2 Drakelow, and the RGHQ Network most of which still remains classified, is the result of over 20 years of research. Credit for this work and donated material is dedicated to the following people: Please click the White hyperlinks to be directed to their websites. Mr. Paul Stokes, author of "Drakelow Unearthed" which chronicals the history of Drakelow Tunnels - RGHQ 9.2 History. Steve Fox, author of "Struggle for Survival, Governing Britain after the Bomb" - Emergency Communications Network Information. Subterranea Britannica - RGHQ 9.2 Photographs & Emergency Communications Network Information & Defence Regions. Steve Scanlon - "Ring Bell" - Information on U.K.W.M.O. Communications Network. 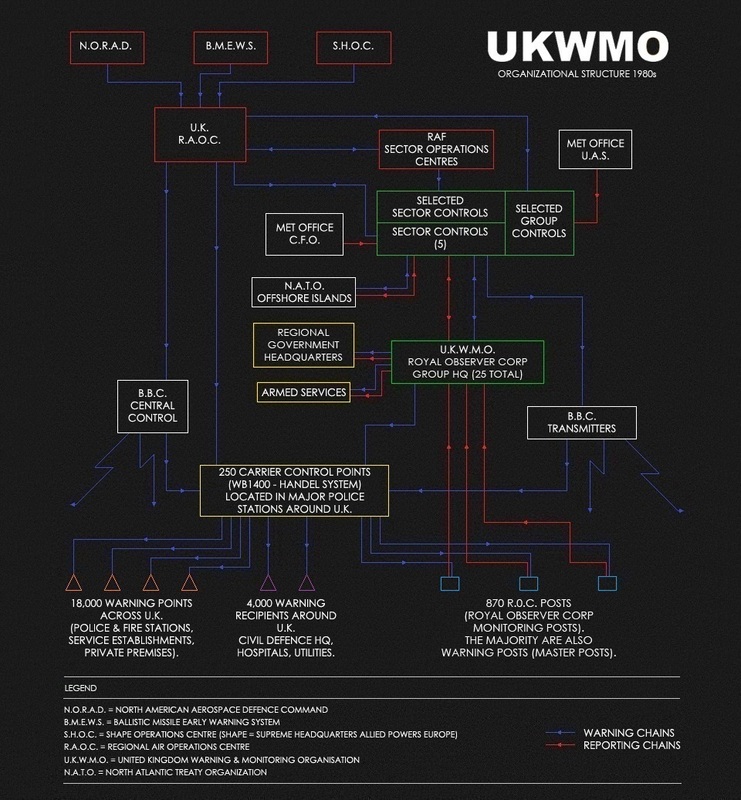 George Coney - "Atomica UK" - Information on U.K.W.M.O. Structure. The Drakelow Tunnels Preservation Trust - RGHQ 9.2 History and Graphics. Miss Helen File of Ellie Brook Photography - BBC Studio Photograph. British Telecom Engineer - Video of RGHQ 9.2. BBC - Information on the Wartime Broadcasting Service.